The aim of this study was to investigate the effects of two different self-adjusting file (SAF) working times and three different chelating agents on the push-out bond strength of root canal fillings in oval root canals. 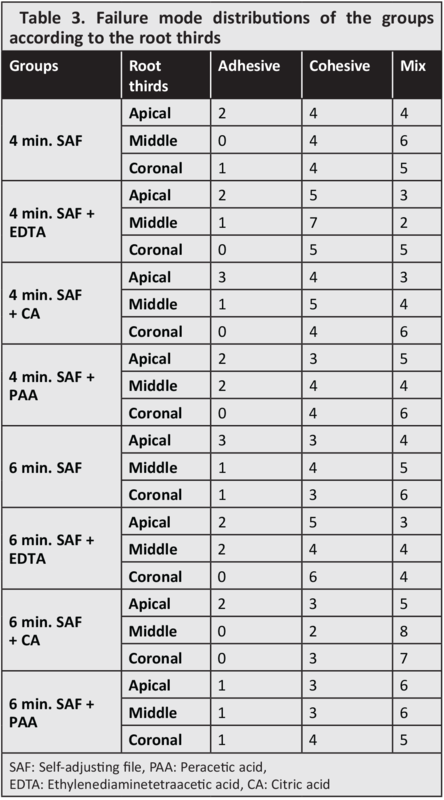 Eighty mandibular premolars were selected and distributed into 8 groups (n=10): 4 min SAF (G1), 4 min SAF + 17% ethylenediaminetetraacetic acid (EDTA) (G2), 4 min SAF + 10% citric acid (CA) (G3), 4 min SAF + 1% peracetic acid (PAA) (G4), 6 min SAF (G5), 6 min SAF + 17% EDTA (G6), 6 min SAF + 10% CA (G7), and 6 min SAF + 1% PAA (G8). The root canals were filled using gutta-percha and AH Plus root canal sealer, and the teeth were prepared for the push-out assessments using 1.0 mm thick root slices. Loading was performed with a universal testing machine at a speed of 0.5 mm/min; and then, collected data were analyzed statistically (α=0.05). While the different chelating agents significantly affected the push-out bond strength of the root canal filling (p<0.05), the different SAF working times did not (p>0.05). There were no significant differences among the groups in the apical and middle thirds of the roots (p>0.05). In the coronal thirds, G6 and G8 indicated significantly greater bond strength values than G1 and G5 (p<0.05). According to the results, the 4 and 6 min SAF working times did not affect the bond strength of the root canal filling. PAA and EDTA can be recommended for root canal irrigation after SAF usage. robably the most important criteria for an ideal root canal therapy is the removal of microorganisms from the root canals (1). However, mechanical instrumentation alone cannot reduce the microbial population in the root canal system, since it creates a smear layer and debris on the dentinal wall surfaces (2). The smear layer and debris could hamper the close contact between the root canal filling material and the dentin (3). Therefore, irrigation solutions act a vital role in the chemomechanical preparation of root canals through the removal of inorganic and organic remnants and the smear layer (4). Moreover, the usage of chelating agents and organic material solvents, alone or in combination, is the fundamental method for smear layer removal (5). Both rotary and reciprocating instruments touch less than 60% of the root canal wall surfaces due to the oval, flat, or irregular shaped canal morphologies (6,7). They also cause hard-tissue debris accumulation in the isthmus regions and the lingual and/or buccal recesses of the oval canals, preventing the removal of debris and jeopardizing the root filling quality (8). 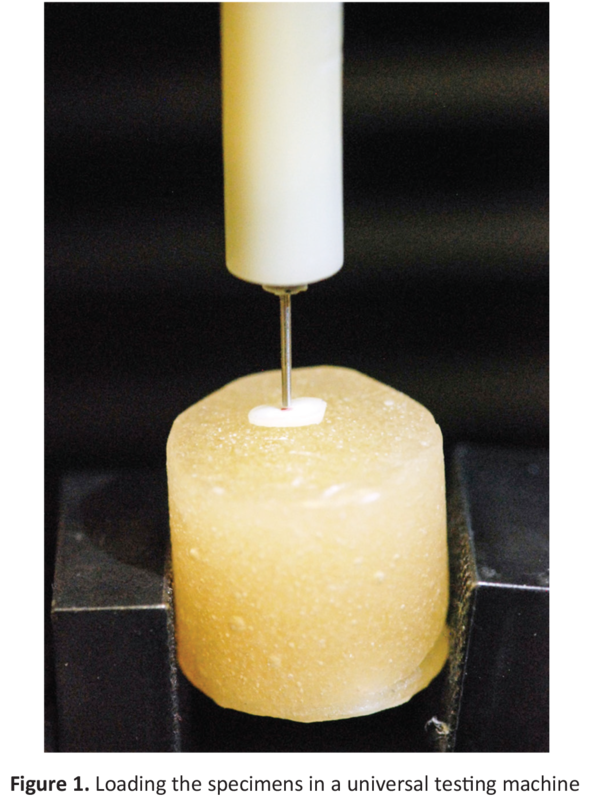 A self-adjusting file (SAF) instrument (ReDent Nova, Ra’anana, Israel) can adapt three-dimensionally to the root canal’s morphology via its highly compressible structure (9). The SAF works in a way similar to sandpaper on the root canal walls because this instrument has no cutting edge flutes (10). It can be used with a VATEA irrigation device (ReDent Nova) that delivers irrigation continuously through the hollow file. The goal of this in vitro investigation was to appraise the effects of two different SAF working times and three different chelating agents on the push-out bonding strength of root canal fillings in ovoid-shaped root canals. Different SAF system working times and various chelating agents do not affect the bonding strength of the root canal filling. The bonding strength of the root canal filling does not vary among the experimental groups in three different root regions. This investigation was confirmed by the Local Ethics Committee of Erciyes University of Medical Sciences (approval number: 2017/449). Group 1 (G1): 4 min SAF usage with 5.25% sodium hypochlorite (NaOCl). Group 2 (G2): 4 min SAF usage with 5.25% NaOCl, then 17% ethylenediaminetetraacetic acid (EDTA). Group 3 (G3): 4 min SAF usage with 5.25% NaOCl, then 10% citric acid (CA). Group 4 (G4): 4 min SAF usage with 5.25% NaOCl, then 1% peracetic acid (PAA). Group 5 (G5): 6 min SAF usage with 5.25% NaOCl. Group 6 (G6): 6 min SAF usage with 5.25% NaOCl, then 17% EDTA. Group 7 (G7): 6 min SAF usage with 5.25% NaOCl, then 10% CA. Group 8 (G8): 6 min SAF usage with 5.25% NaOCl, then 1% PAA. All of the procedures were performed by one operator to standardize the experiments. In all groups, the SAF instrument was operated using a pecking motion in combination with a continuing flow of 5.25% NaOCl (0.4 mm amplitude and 5.000 vibrations per minute) supplied by the VATEA peristaltic motor at a flowing rate of 6 mL/min in the 4 min groups, and 4 mL/min in the 6 min groups. As a result, 24 mL of NaOCl was used in each group. All of the chelating agent irrigations were performed using the conventional syringe irrigation technique. A 30-gauge needle was introduced 1 mm short of the working length of the root canal, and 3 mL of 17% EDTA, 3 mL of 10% CA, or 3 mL of 1% PAA was delivered for 3 min in each specimen to remove the smear layer. Then finally, 3 mL of distilled water was used for 3 min for the rinsing of each specimen. Absorbent paper points were used to dry the root canals. By using the cold lateral compaction technique, root canals were obturated with AH Plus root canal sealer (Dentsply DeTrey GmbH, Konstanz, Germany) and gutta-percha (DiaDent Group International, Chungcheongbuk-do, Korea). To confirm the completed fillings buccolingual and mesiodistal radiographs were obtained. The excess gutta-percha was cut from the cementoenamel junction level by using a heated hand plugger, and the access cavities were covered with Cavit G (3M ESPE, Seefeld, Germany) temporary filling material. Then, the teeth were kept at 37 °C in 100% humidity for 7 days for the fully setting of the root canal sealer. All roots were cut perpendicularly to the long axis of the roots by using diamond-coated saw at a slow-speed (IsoMet; Buehler, Lake Bluff, IL, USA) to acquire three 1 mm thick specimens (one from the apical, one from the middle, and one from coronal third). A digital caliper was used to verify the 1 mm thickness of the specimens. Subsequently, all of the specimens were inspected with an operating microscope (OPMI pico; Zeiss, Germany) to determine if any artifacts or cracks occurred as a result of the slicing process, and no artifacts or cracks were seen. A felt tip marker was used to define the apical sides of each specimen. Next, a cylindrical plunger which was made of stainless steel (diameter of 0.5, 0.7, or 0.8 mm for the apical, middle, and coronal regions, respectively) was selected and located to cover the majority of the root filling surface as possible upon loading, while refraining any touch with the canal walls. The root canal fillings were subjected to the loads from the apical to the coronal direction. Push-out bond strength tests were done with a universal testing machine (Instron, Canton, MA, USA) at a cross-head speed of 0.5 mm/min until dislodgement happened (Figure 1). The force required to dislodge the root filling was saved in Newtons (N). Then, the dislodgement force was converted to shear stress (in MPa) by dividing the dislodgement force by the surface area of the bonded interface of a trapezoid, as Pereira et al. (11) used in their study. The surface area was calculated by taking the average of the length of the perimeter of the root filling in millimeters on the apical and coronal sides of each specimen and multiplying it by the height of the slice. To assess the failure modes of loaded slices, an operating microscope was used at 10x magnification. Failure modes were evaluated according to three categories: adhesive failure (no root canal sealer on the dentin surface), cohesive failure (surface of the dentin was covered with sealer), and mixed failure (cohesive and adhesive failure modes mixture). The collected data were assessed statistically by using a Two-Way ANOVA test (chelating agent and working time) with SPSS software (SPSS 20.0; SPSS Inc., Chicago, IL, USA). To make pairwise comparisons among the groups, The One-Way ANOVA and Tukey’s post-hoc tests were used (α=0.05). The failure modes of the groups were expressed as frequencies. 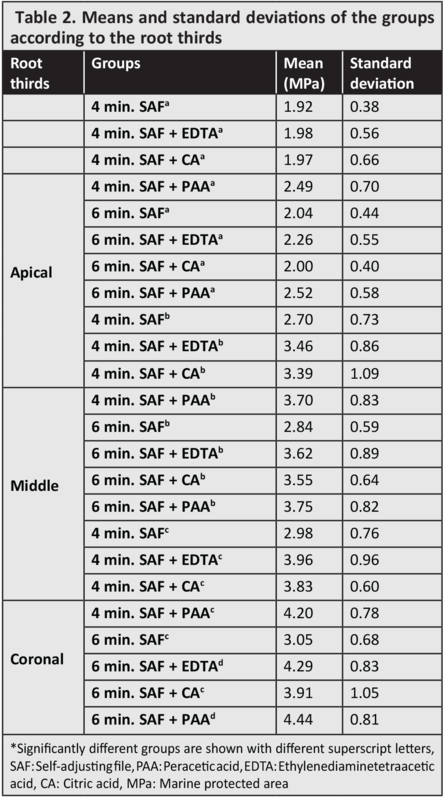 Two-Way ANOVA test showed that while the different chelating agents significantly affected the push-out bonding strength of the root canal filling (p<0.05), the different SAF working times did not (p>0.05) (Table 1). No significant differences detected among the groups in the apical and middle thirds of the roots (p>0.05). Moreover, in the coronal third, G6 and G8 showed greater bonding strengths than G1 and G5 (p<0.05) (Table 2). The error bar graph of the bonding strength values is shown in Figure 2. While the cohesive and mixed failures were observed the most frequently in all of the groups; adhesive failure mode was the least observed. Distributions of failure modes are shown in Table 3 according to the root thirds. Oval-shaped root canals represent a major challenge to prepare and fill (12); therefore, mandibular premolar teeth with oval root canal morphology were selected for the present study. SAF instrument was manufactured to cope with the mismatch problem of nickel titanium (NiTi) rotary files with the irregular shape of the root canal system (9). The irrigation solution passing through the instrument’s oscillating metal lattice enhances the efficiency of debridement of the root canal (13). Paque et al. (14) showed that the SAF system preparation produced less hard-tissue debris during instrumentation than the traditional NiTi rotary preparation. NaOCl is one of the most common used irrigation solutions in root canal treatment (15). It has a strong antimicrobial effect and is able to dissolve necrotic and organic tissues; however, it is not capable of dissolving the inorganic components of the smear layer (16). The inorganic part of the smear layer can be removed by chelating agents; thus, exposing a great number of dentin tubules, which may enhance adhesion due to the increased contact area and improve the adaptation between the root canal sealer and the dentin (3). Hence, the consecutive use of inorganic and organic solvents as irrigation solutions has been suggested, because there has been no proven single irrigation solution that can remove the smear layer alone yet (17). In this study, three different chelating agents were used after the SAF instrumentation in combination with the NaOCl. In all of the groups, in total, 24 mL of NaOCl was used to standardize the irrigation volume. Even in the presence of organic matter PAA is not inactivated, does not leave residue, and does not produce environmentally harmful byproducts (18,19). Moreover, investigations into its use in endodontics have revealed its ability to remove the smear layer (19,20). Another chelating solution, EDTA, is a widely used and effective chelating agent that can dissolve the mineralized part of the smear layer (3,21). For effectively removing of the smear layer from the dentinal walls a combination of EDTA and NaOCl is suggested (22). One previous study reported that operating the SAF system in combination with EDTA and NaOCl irrigation provided a root canal wall that was significantly free of the smear layer (13). Furthermore, CA is a weak organic acid that is used as an aqueous acidic solution (23). In the literature, there are some studies that compare the smear layer removal effectiveness of EDTA and CA; however, those findings are contradictory. Certain studies reported that 10% CA is more effective than EDTA (24,25); in contrast, some studies found no significant difference between them (23,26). In the present study, the root canal filling was applied using gutta-percha and AH Plus epoxy resin based sealer with a lateral compaction method, which is the most commonly used root canal filling technique in clinical practice. AH Plus binds with the organic phase of dentin, and the binding of the root canal sealer to the root dentin sustains the integrity of the sealer-dentin interface over the long term (27,28). The manufacturer of the SAF system advises a 4 min use of the instrument under constant irrigation solution flow (29). In addition, studies using the SAF system at different working times are available in the literature. These studies are about the amount of deformation of the SAF instrument and the reduction of the number of microorganisms in the root canal (30,31). However, there are no studies in the literature about the effects of various SAF working times on the push-out bonding strength of the root filling to the dentinal walls. In our results, the Two-Way ANOVA test showed that the different SAF working times did not affect the results (p>0.05). Hof et al. (10) stated that major abrading effectiveness of the instrument and most of the root canal shaping occurred at first 2 min of usage. However, SAF instruments can be worn out after such a prolonged use; therefore, this result is not surprising. There might not have been much greater canal preparation among the experimental groups, and this might not have made a difference in terms of the working time. According to the findings of this study, no significant difference was observed among the groups in the apical thirds (p>0.05). This could be because a lower amount of irrigant reached the apical area and sclerotic structure of the dentinal tubules in the apical region. In addition, the more complex structure of the dentinal tubules in the apical area can make the penetration of epoxy resin into the tubules difficult (27). There were no significant differences among the experimental groups in the middle thirds (p>0.05), which could be due to the flushing of the middle regions with a higher amount of irrigating solution. Lastly, in the coronal thirds, no significant differences were observed among the groups (p<0.05). G6 and G8 showed significantly greater bonding strengths than G1 and G5 (p<0.05). In addition, the Two-Way ANOVA test showed that the chelating agent type affected the bond strength values (p<0.05), suggesting that the use of EDTA and PAA after the 6 min SAF system preparation enhanced the bond strength of the root canal filling in the coronal third. This could be the result of a longer NaOCl agitation time in the coronal third, which has a greater canal space that can fill up with irrigant. Following the chelator, application with PAA and EDTA might cause cleaner dentinal walls and greater bond strengths than in the no chelating agent groups. In one previous study, the authors indicated that exposure of the organic phase with EDTA was significant for the ability of the AH Plus root canal sealer to adhere to the root dentin (27). In addition, De-Deus et al. (20) stated that PAA is as effective as a 17% EDTA solution in terms of dissolving the smear layer. In all of the groups, the least observed failure mode was adhesive failure. This finding may indicate relatively clean dentinal walls due to the effective debridement capability of the SAF system, and thus, the enhanced binding of the root canal sealer to the dentin surface. Higher frequencies of the cohesive and mixed failure types in the groups could be attributed to the mismatch of the cylindrical form of the plungers used and the oval shape of the root canals. Therefore, the root canal filling may have been left in the recesses of the canal. The bonding strength of the root canal filling was not affected by the 4 min vs. 6 min SAF working times. Furthermore, the use of PAA and EDTA can be recommended for irrigating the root canals after SAF system usage. However, there is a need for further studies to investigate the activities of varied irrigation solutions during or after the use of SAF over different periods of time. Ethics Committee Approval: This investigation was confirmed by the Local Ethics Committee of Erciyes University of Medical Sciences (approval number: 2017/449). Concept: T.A., İ.Ş., Design: T.A. Data Collection or Processing: İ.Ş., Analysis or Interpretation: T.A., Literature Search: T.A., İ.Ş., Writing: T.A. Chugal NM, Clive JM, Spangberg LS. A prognostic model for assessment of the outcome of endodontic treatment: Effect of biologic and diagnostic variables. Oral Surg Oral Med Oral Pathol Oral Radiol Endod 2001; 913: 342-52. Kuruvilla A, Jaganath BM, Krishnegowda SC, Ramachandra PK, Johns DA, Abraham A. A comparative evaluation of smear layer removal by using edta, etidronic acid, and maleic acid as root canal irrigants: An in vitro scanning electron microscopic study. J Conserv Dent 2015; 18: 247-51. Torabinejad M, Handysides R, Khademi AA, Bakland LK. Clinical implications of the smear layer in endodontics: a review. Oral Surg Oral Med Oral Pathol Oral Radiol Endod 2002; 94: 658-66. Elnaghy AM. Effect of QMix irrigant on bond strength of glass fibre posts to root dentine. Int Endod J 2014; 47: 280-9. Taneja S, Kumari M, Anand S. Effect of QMix, peracetic acid and ethylenediaminetetraacetic acid on calcium loss and microhardness of root dentine. J Conserv Dent 2014; 17: 155-8. Paque F, Ganahl D, Peters OA. Effects of root canal preparation on apical geometry assessed by micro-computed tomography. J Endod 2009; 35: 1056-9. Versiani MA, Pecora JD, de Sousa-Neto MD. Flat-oval root canal preparation with self-adjusting file instrument: a micro-computed tomography study. J Endod 2011; 37: 1002-7. Robinson JP, Lumley PJ, Cooper PR, Grover LM, Walmsley AD. Reciprocating root canal technique induces greater debris accumulation than a continuous rotary technique as assessed by 3-dimensional micro-computed tomography. J Endod 2013; 39: 1067-70. Metzger Z. From fles to SAF: 3D endodontic treatment is possible at last. Alpha Omegan 2011; 104: 36-44. Hof R, Perevalov V, Eltanani M, Zary R, Metzger Z. The self-adjusting file (SAF). Part 2: mechanical analysis. J Endod 2010; 36: 691-6. Pereira RD, Brito-Junior M, Leoni GB, Estrela C, de Sousa-Neto MD. Evaluation of bond strength in single-cone fillings of canals with different cross-sections. Int Endod J 2017; 50: 177-83. De-Deus G, Souza EM, Barino B, Maia J, Zamolyi RQ, Reis C, et al. The self-adjusting file optimizes debridement quality in oval-shaped root canals. J Endod 2011; 37: 701-5. Metzger Z, Teperovich E, Cohen R, Zary R, Paque F, Hulsmann M. The self-adjusting file (SAF). Part 3: removal of debris and smear layer-A scanning electron microscope study. J Endod 2010; 36: 697-702. Paque F, Laib A, Gautschi H, Zehnder M. Hard-tissue debris accumulation analysis by high-resolution computed tomography scans. J Endod 2009; 35: 1044-7. Aranda-Garcia AJ, Kuga MC, Vitorino KR, Chavez-Andrade GM, Duarte MA, Bonetti-Filho I, et al. Effect of the root canal final rinse protocols on the debris and smear layer removal and on the push-out strength of an epoxy-based sealer. Microsc Res Tech 2013; 76: 533-7. Kara Tuncer A. Effect of QMix 2in1 on sealer penetration into the dentinal tubules. J Endod 2015; 41: 257-60. Violich DR, Chandler NP. The smear layer in endodontics - a review. Int Endod J 2010; 43: 2-15. Chassot AL, Poisl MI, Samuel SM. In vivo and in vitro evaluation of the efficacy of a peracetic acid-based disinfectant for decontamination of acrylic resins. Braz Dent J 2006; 17: 117-21. Lottanti S, Gautschi H, Sener B, Zehnder M. Effects of ethylenediaminetetraacetic, etidronic and peracetic acid irrigation on human root dentine and the smear layer. Int Endod J 2009; 42: 335-43. De-Deus G, Souza EM, Marins JR, Reis C, Paciornik S, Zehnder M. Smear layer dissolution by peracetic acid of low concentration. Int Endod J 2011; 44: 485-90. Zehnder M, Schmidlin P, Sener B, Waltimo T. Chelation in root canal therapy reconsidered. J Endod 2005; 31: 817-20. Calt S, Serper A. Time-dependent effects of EDTA on dentin structures. J Endod 2002; 28: 17-9. Di Lenarda R, Cadenaro M, Sbaizero O. 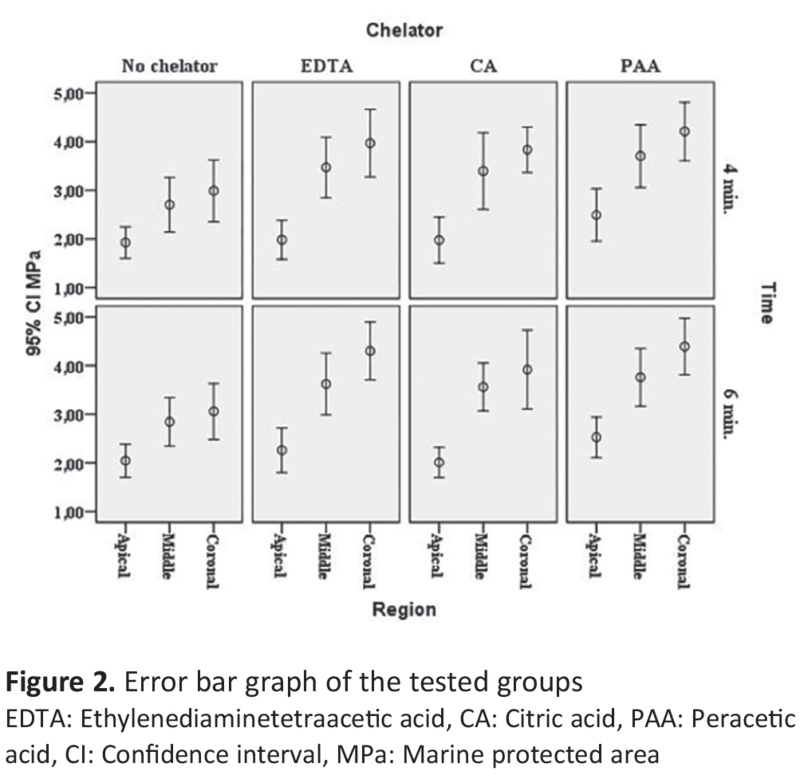 Effectiveness of 1 mol L-1 citric acid and 15% EDTA irrigation on smear layer removal. Int Endod J 2000; 33: 46-52. Gutmann JL, Saunders WP, Nguyen L, Guo IY, Saunders EM. Ultrasonic root-end preparation. Part 1. SEM analysis. Int Endod J 1994; 27: 318-24. Machado-Silveiro LF, Gonzalez-Lopez S, Gonzalez-Rodriguez MP. Decalcification of root canal dentine by citric acid, EDTA and sodium citrate. Int Endod J 2004; 37: 365-9. Scelza MF, Teixeira AM, Scelza P. Decalcifying effect of EDTA-T, 10% citric acid, and 17% EDTA on root canal dentin. Oral Surg Oral Med Oral Pathol Oral Radiol Endod 2003; 95: 234-6. Neelakantan P, Subbarao C, Subbarao CV, De-Deus G, Zehnder M. The impact of root dentine conditioning on sealing ability and push-out bond strength of an epoxy resin root canal sealer. Int Endod J 2011; 44: 491-8. Ureyen Kaya B, Kececi AD, Orhan H, Belli S. Micropush-out bond strengths of gutta-percha versus thermoplastic synthetic polymer-based systems - an ex vivo study. Int Endod J 2008; 41: 211-8. Metzger Z, Teperovich E, Zary R, Cohen R, Hof R. The self-adjusting file (SAF). Part 1: respecting the root canal anatomy--a new concept of endodontic files and its implementation. J Endod 2010; 36: 679-90. Akcay I, Yigit-Özer S, Adigüzel O, Kaya S. Deformation of the self-adjusting file on simulated curved root canals: a time-dependent study. Oral Surg Oral Med Oral Pathol Oral Radiol Endod 2011; 112: 12-7. Alves FR, Almeida BM, Neves M, Rôças IN, Siqueira JF Jr. Time-dependent Antibacterial Effects of the Self-Adjusting File Used with Two Sodium Hypochlorite Concentrations. J Endod 2011; 37: 1451-5.